GOAL This is the funniest book I have ever written - and the ambiguity here is deliberate. Much of this book is about deliberate ambiguity, described as unambiguously as possible, so the previous sentence is probably the fIrst, last, and only deliberately ambiguous sentence in the book. Deliberate ambiguity will be shown to underlie much, if not all, of verbal humor. Some of its forms are simple enough to be perceived as deliberately ambiguous on the surface; in others, the ambiguity results from a deep semantic analysis. Deep semantic analysis is the core of this approach to humor. 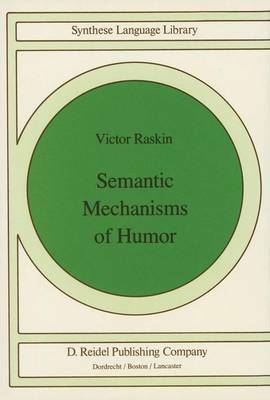 The book is the fIrst ever application of modem linguistic theory to the study of humor and it puts forward a formal semantic theory of verbal humor. The goal of the theory is to formulate the necessary and sufficient conditions, in purely semantic terms, for a text to be funny. In other words, if a formal semantic analysis of a text yields a certain set of semantic proptrties which the text possesses, then the text is recognized as a joke. As any modem linguistic theory, this semantic theory of humor attempts to match a natural intuitive ability which the native speaker has, in this particular case, the ability to perceive a text as funny, i. e. , to distinguish a joke from a non-joke.